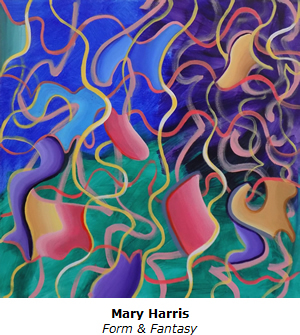 Sanchez Art Center is pleased to present a retrospective exhibition of the paintings of Mary Harris in a show titled A Colorful Life: Mary Harris at 100. The opening reception is on Friday, June 2, from 7 to 9 pm. Music for the reception will be provided by Julie & Brian Novak-McSweeney of Blue City Jazz. Mary Harris is well known in Pacifica for her beautiful artworks, her many contributions to the community, and the warmth and lively intelligence that she brings to all her interactions. In this retrospective, most of the artworks were created in the 21st century, but the exhibition spans 50 years, with at least one painting from each decade since 1967. Harris’ works show the depth of her involvement with universal themes of human life, love, justice, suffering, and growth, and with the beauty of nature. Harris is known for her affinity with strong color, hence the show title, A Colorful Life. At the same time, she has the ability to paint flowing figures and shapes with the simplicity of line drawing, as seen in Form & Fantasy (2006) and Moondream (1995). The artist worked as a teacher of young children most of her life, both locally and overseas (Japan, France, Germany, and Taiwan). She even taught for a few months at the Sanchez Elementary School (the campus that now houses the Pacifica Center for the Arts). Harris was instrumental in rooting art at the former elementary school with her participation in the Schools with Art Program (SWAP). Through this partnership, artists provided hands-on art education at local schools in exchange for studio space. She then shared her studio with Andrew Leone, who led the movement to bring an art center to Pacifica at the site. 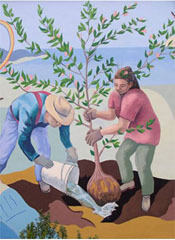 Harris was on the board of the Arts & Heritage Council (which later morphed into the Pacifica Performances organization), and has been a longtime member and supporter of the Art Guild of Pacifica. For many years she helped keep the galleries open by serving as gallery staffing coordinator. Harris has also volunteered over the years for many progressive social and political organizations, including the Democratic World Federalists. She still lives in Shelter Cove, Pacifica, where she walks the 160 steps to get in and out of the cove, and enjoys the beauty of the coast and the relationships with her neighbors and friends. Harris loves to begin a fresh white canvas and discover how she will organize the space into a painting. The artist’s advice to young artists is twofold: “Be yourself and work hard.” Certainly Ms. Harris has lived by these precepts, and we are the richer for it. On Sunday, June 25, at 3:30 pm, there will be a closing celebration for Mary Harris, including remarks by the curator of her exhibit, Sanchez studio artist Charlotte Seekamp. on closing Sunday, June 25, at 3:30 pm.